Our Rides are nose-to-tail due to the type of terrain because we love and respect our horse’s riding at 8,700ft to 10,500ft in elevation depending on the ride and the safety of our clients. Granite Mountain Outfitters is a summer & fall activity business with twenty years of experience, specializing in western outdoor and ranch fun for everyone. 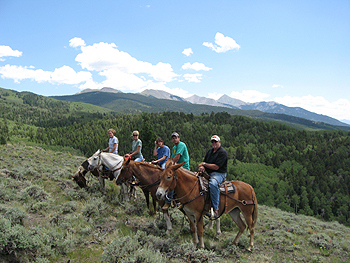 What better way to view the beauty of Colorado’s wilderness than from the back of a horse? Our small ride sizes ensure that our guests receive the personal attention they deserve to have a truly interactive horseback experience. We ride along the base of the Sangre De Cristo Mountains, which means “Blood of Christ” named for the blazing red sunsets cast on the snowcapped peaks. With a view of Colorado’s most difficult fourteeners, the Crestones, the Sierra Blaca, Mount Shavano and Tabeguache Peak (Sawatch Range), Historical Mt. 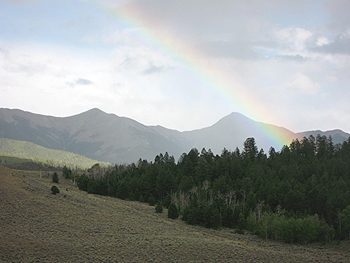 Ouray, the Great National Sand Dunes and the San Luis Valley. Our experienced native mountain horses and wranglers will take you out for a one-hour, two-hour, half day or full day horseback ride an adventure where you will enjoy the great outdoors. We supply all the gear necessary to ensure a fun and safe ride. From greenhorn to expert, Granite Mountain Outfitters caters to the horseman in each of us, taking you back in time to the days when a trip through the Rockies was only possible on horseback. Contact Granite Mountain Outfitters today for a ride of a lifetime. 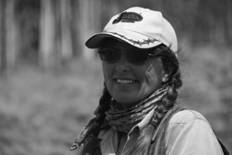 With over 30 years in the outfitting business, we know how to put together memorable adventures! A Message from Your Outfitter I would like to thank you for taking a look at the Granite Mountain Outfitters recreational riding program. We are committed to offering the very best riding experience that the Rocky Mountains has to offer. Whether your ride is wilderness or private ground, guided or unguided, you can expect the best in riding accommodations and service. There is a formula for a successful riding experience – prime country, quality of riding livestock and experienced guides and wranglers. If you have dreamed of experiencing the ride of a lifetime in the Rocky Mountains, we can get you there. It’s a privilege to be working in this industry. We are Granite Mountain Outfitters. We respect the land and the animals that live here. Our staff is experienced, professional and ready to take you on the experience of a lifetime.